This particular ambulance services 900 miles of area in NW Kansas including patient transport to surrounding and out of state hospitals. A grant from the Hansen Foundation funded a new power lift cot to make loading patients easier and safer. 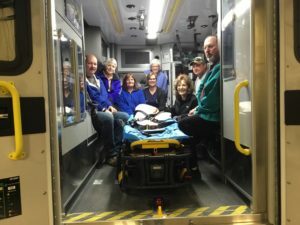 The new system has allowed transport of a 700-pound patient with no stress or strain to the first responders, and meets crash-test safety standards for maximum occupant safety.